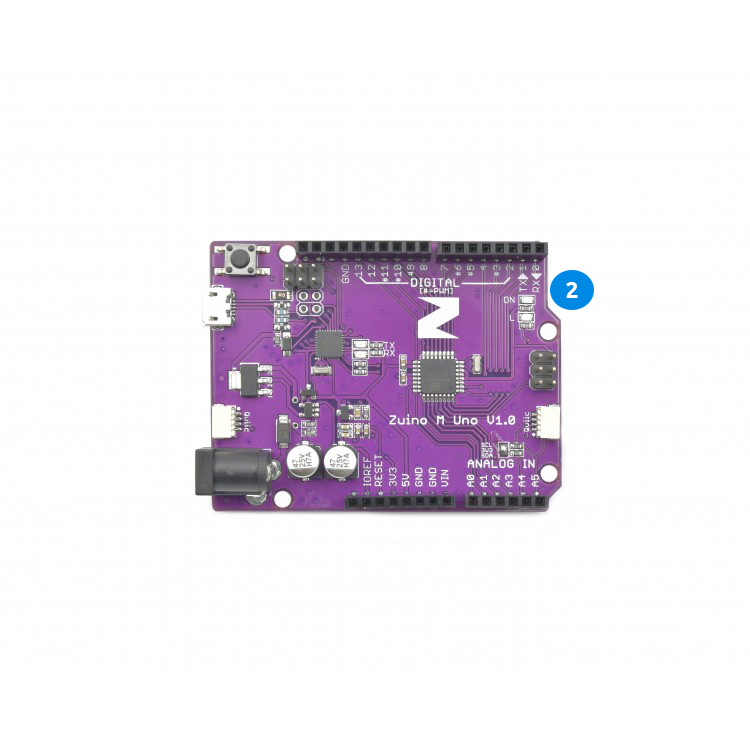 You can build your very own automated home watering plant system with this sensor combined with our Zio development boards, it will be a cool project you can call your own. Our sensor, like most others, is incorporated with the Qwiic Connector System. We can safely say that, to date, this is the first of its kind that incorporates qwiic technology in the market. 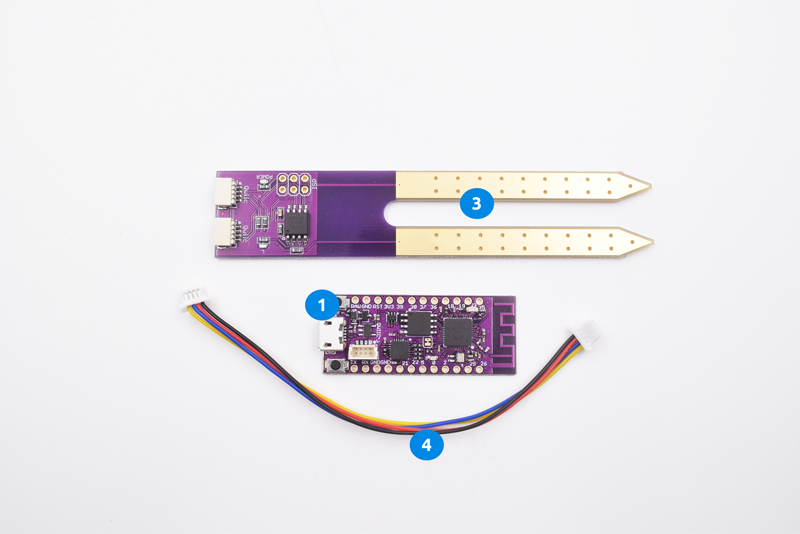 Qwiic is an ecosystem of I2C sensors, actuators, shields, and cables that make prototyping faster and less prone to error. We have a separate page dedicated to explaining what Qwiic connector is. You can learn more about it here. We incorporate high performance, low powered CMOS 8-bit microcontroller from ATMEL. This ATtiny85-20-SMT chip uses Advanced RISC (Reduced Instruction Set Computing) Architecture mostly found in Apple products. It is also capable of capacitive touch sensing, which is needed with our sensor to detect moisture levels. You can refer our datasheet for the full features of this MCU. There is a lot of Soil moisture sensor out there in the market. But not all sensors use ENIG (Electroless nickel immersion gold) surface plating which is very useful in preventing oxidation. That is why our sensor spike is finished with a beautiful gold coating. We wanted to provide peace of mind to our users that our sensors have a longer lifespan than most sensors without the gold finishing. We created this sensor with the main objective that although it is very handy for qwiic enabled components and modules, we also want it to be useful to non-qwiic enabled components and modules too. 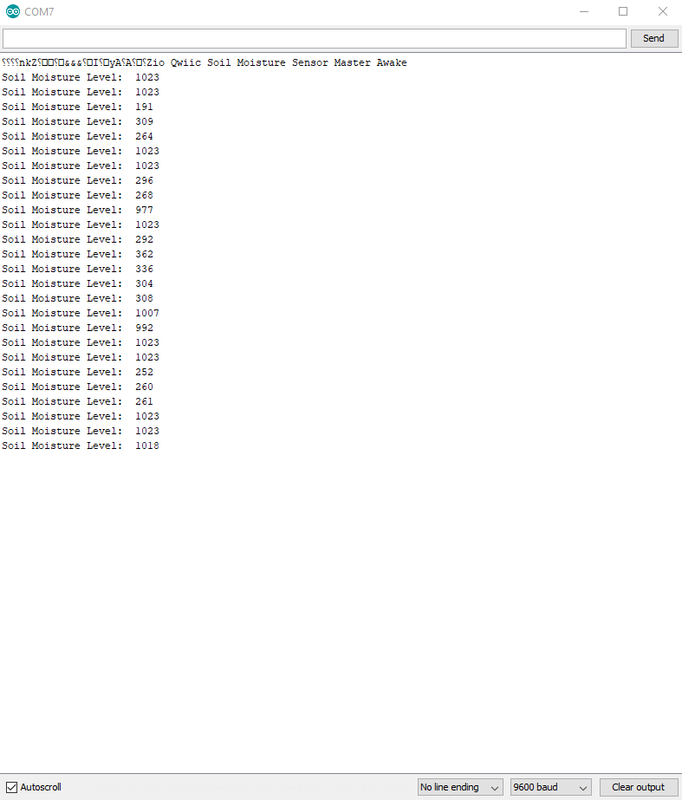 Hence, the ICSP headers are there specifically for this purpose. This is something you will rarely see in a soil moisture sensor. What this does is to provide an LED indicator (with some coding) that will ‘blink’ telling you that your soil is in need of hydration or not. The “severeness” depends on how slow or fast your LED ‘blinks’. 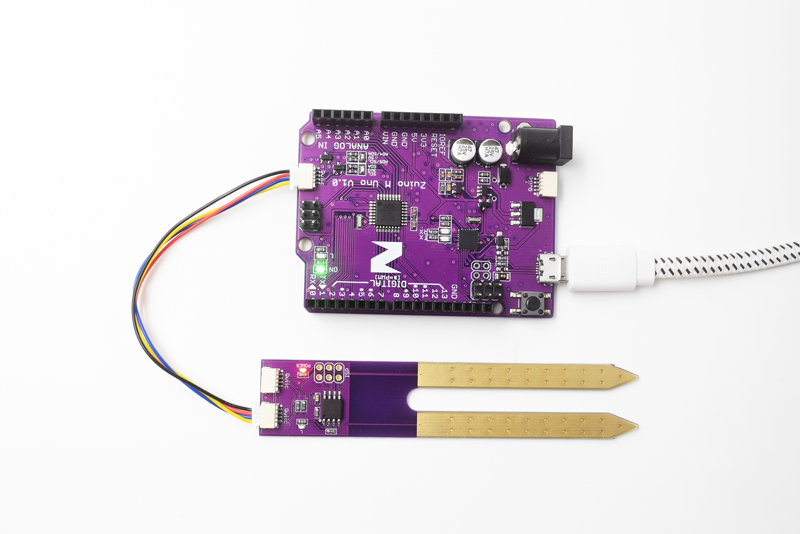 Like most of our Zio boards, our Soil moisture sensor is also preinstalled with a Power indicator. This just lets you know if your sensor is connected or not. To know if your sensor is working fine, the Power LED indicator should light up normally. 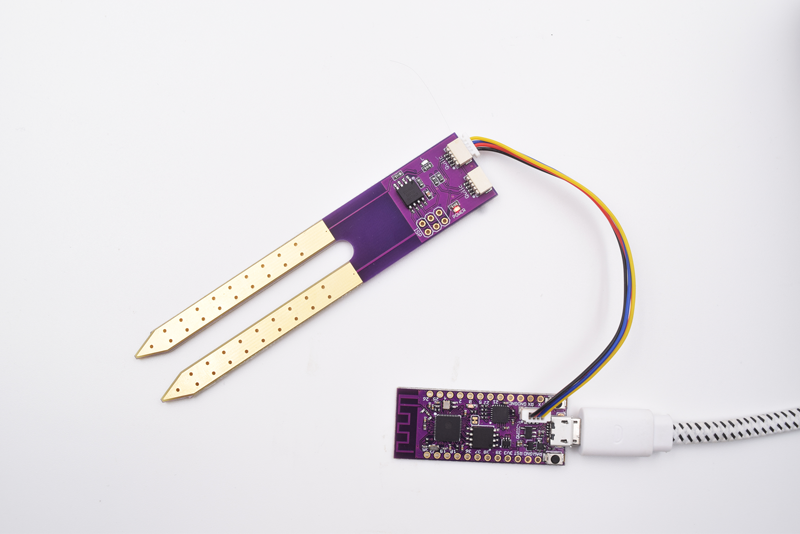 Download and open the Soil Moisture Sensor Firmware. Follow the Basic reading steps below to test your soil moisture sensor. Upload the code to your board. In the void loop() section there is a function called, get_value() this is where your sensor will read the moisture level. You will need to calibrate your sensor according to your plant's soil moisture. 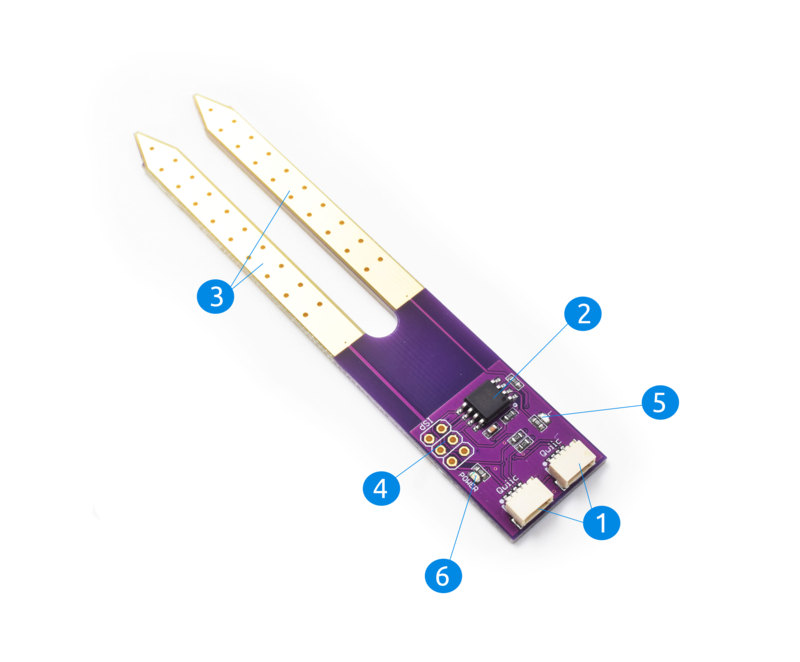 To do that insert the probes of the soil moisture sensor into your plant soil to check basic reading. Open the Serial monitor to check the readings of your Dry and Wet soil captured by the sensor. Your serial monitor will list out the moisture level of your plant’s soil. A HIGH value indicates your soil is ‘Dry'. A LOW value indicates your soil is ‘Wet’. From the above values, you can calibrate your board to detect the value of moisture that is right for your soil so you can program your board sensor to automatically detect the dryness of your soil and warn you that it needs the required H2O. You now have a basic understanding of how to set up your soil moisture sensor. In the meantime check out our other awesome and cool Zio projects to give you that qwiic inspiration! Want to build your very own automated watering plant system? 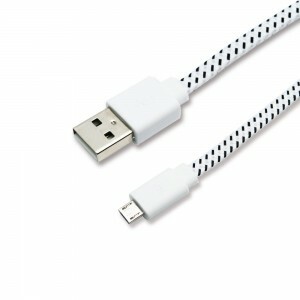 Didn’t know how to start and where to get one? Our Zio Plant Hydrating kit will have you start building one in no time! Give your plant that H20 love it needs automagically with the kit! Purchase one (or more) here!